The hamstring actually consists of three hamstring muscles that are susceptible to a large range of injuries ranging from a niggling tightness in the hamstrings to sore hamstrings and even a tear in the hamstring muscle. Many individuals possess imbalances in the strengths of the flexors and extensors of their hips and knees. Add hamstring fatigue to the mix, and the hamstrings can tighten, cramp, strain, or the hamstring muscle can even tear at the drop of a hat. Like many muscular injuries, hamstring misery tends to return again and again, especially since athletes tend not to address the source of their hamstring difficulties. Too many athletes simply rest - or "cross train" - and hope for the best, without figuring out why their hamstrings went astray. To understand how Rolfing treatment for the hamstring works, it is important to recognize that hamstrings that need stretching are usually holding tension - that is, they are actively contracting. In that case, the person is holding the hamstring tense by habit, unconsciously. If you try to relax the hamstring, you probably will find you cannot relax the hamstring and hence assume that the hamstring muscles are completely relaxed and don’t need stretching. You may not realize that the hamstring muscles are contracting "on automatic" due to postural habit. That is why hamstrings (and other muscles) tighten up again so soon after the hamstrings are stretched or massage. Better results come by changing a person’s posture and bringing the body back into alignment. That is the key to the Rolfing approach to hamstrings. As you walk into the clinic, the Rolfer will assess your posture to ascertain if there is any imbalance or underlying conditions in our body contributing to your hamstring difficulties. Once this is done, the Rolfer will use his elbows and knuckles on the myofascia to release tension in your hamstrings at the fascial level. The Rolfer will also look at your body as a whole to ascertain if there are other causes for your hamstring problems. For example, he may look into the balance of the feet itself because if you have a pronated foot your knees will bend inward, causing a rotation of the hips and tension in the hamstring, especially if you are doing a repetitive exercise or active sports. 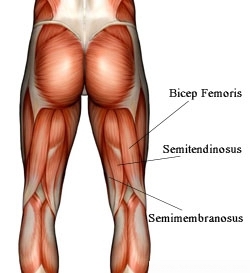 Why are the hamstrings so important? In short, hamstrings are important because they support so many other muscle groups and reinforce your posture. Because of this interrelation, if you do not take care of your hamstrings, hamstring problems will affect other parts of our body. - Tight hamstrings can cause the hips and pelvis to rotate back flattening the lower back and causing back problems. - Tight hamstrings contribute to lordosis by pulling the knees behind the body's vertical centerline (i.e. locking the knees). The whole body sways forward, accentuating the spinal curves. - If the outer hamstrings are tighter than the inner ones, the lower leg rotates toe-outward. This twist in the knee joint contributes to knee pain, to knee injuries, and to ungainly movement. As you can see, hamstring tension has far-reaching effects on movement, balance, and the health of joints. Rolfing’s great strength is that it is non-invasive, and hence while undergoing Rolfing you will be able to continue with your sports, while simultaneously relaxing the hamstring muscle, which will allow you a greater range of movement around the hamstring and increase your flexibility. Rolfing also addresses the muscles surrounding the hamstrings like the calves and quadriceps to provide a holistic response. The standard prescribed treatment for hamstring injuries usually involves stretching, but this often is not enough. Recent scientific studies have shown us that the hamstrings are continuous system with the ligaments in the pelvis and the low back muscles. This supports the Rolfing understanding of the hamstring as essentially one part of the larger myofascial structure. Anything that makes part of this structure shorter will make hamstring problems keep coming back. Forcible stretching of your hamstrings is even worse. As anyone who has had someone stretch their hamstrings for them knows, forcible stretching is also usually a painful ordeal. In addition, stretching the hamstrings disrupts their natural coordination with the quadriceps muscles, which is why ones legs feel shaky after stretching the hamstrings.